We provide fresh, relevant, local, and customized data for employers to benchmark their benefit plans using proprietary tools that are unique in the marketplace. Try us today! Have you ever been involved with an obvious situation, either personally or professionally, that was largely ignored and going unaddressed? Perhaps a work scenario in which a manager who wields considerable organizational power was impacting the workplace culture in an extremely uncomfortable and unhealthy direction. Speaking up may cause one to lose his/her job or suffer long-term upward job mobility opportunities. Self-preservation is a natural powerful reaction when confronting a seemingly formidable opponent – we simply choose not to act at all. This is happening today in our healthcare delivery and payment environment. We frequently see or experience unacceptable situations that clearly require action to prevent it from happening in the future. As a reader of my blogs, you are keenly aware of the egregious nature of the medical establishment hiding their preventable medical error ‘indiscretions’ in the proverbial litterbox – covering up preventable mistakes that are not meant for public viewing. Yet, without being held accountable for their actions, the medical community will continue to repeat what should be un-repeatable. The elephant exists in healthcare in a number of ways. Below are just a few prime examples. Employers serve as the real payers of healthcare, yet oddly sit on the sidelines exhaustively complaining about the high cost of health insurance and how it adversely impacts their competitiveness in the markets they serve. Unfortunately, most employers are reluctant to bring up the inherent dysfunctional problems because hospitals and medical practices are considered to be ‘other’ large, recognizable community members that are off-limits to public correction. In fact, many business owners are board members at the local hospital, making it difficult to publicly speak up while serving in a ‘distinguished’ role. As real payers, employers can clearly climb into the driver’s seat to collectively initiate sorely-needed changes in how the healthcare establishment behaves. But to do so, they must firmly take hold of the steering wheel to begin the journey. Instead, the employers have historically farmed out this responsibility to the insurance companies. One can be equally mystified by insurance companies’ lack of initiative when it comes to medical errors. By default, these ‘third-party payers’ assume the purchasing role as an intermediary between the real payers and health providers. More often than not, employers assume that insurance companies are adequately vetting the quality-of-care their network providers are giving to their employees and family members. This is largely not happening. As a paid intermediary, insurers can play a vital role in determining whether their subscribers are receiving the best possible outcomes from the care being purchased through the insurers’ networks. Because the medical community will not admit their playful litterbox games, an appropriate opportunity for safety-conscious insurers would be to randomly survey their members after they have been discharged from a hospital to learn about their experiences – specifically as it relates to preventable medical errors. Doing so could be a great branding opportunity for innovative, forward-thinking insurance carriers. Over time, when enough patient feedback has been collected and analyzed, insurers can then become a more engaged advocate for employers and their employees when vetting network providers. Why are insurers not performing this difficult but necessary work on behalf of their members? Great question. They should. Similar to a certain species of cicadas, which are insects that remain underground from 2-to-17 years before emerging to be seen and heard, the hospital community will annually reveal themselves to promote their substantial workforce and economic growth – but remain curiously silent on the indiscretions buried deep inside the litterbox. Apparently, this marketing scheme successfully elevates their status as the elephant in any room, whether it be in Iowa or some other state. This diversional tactic makes it difficult for others to honestly speak out about the associated problems the elephant causes within our communities. After all, who doesn’t want jobs? No one wants to be ridiculed as a ‘naysayer.’ Unfortunately, honesty may come at a great expense. Joe Gardyasz of the Des Moines Business Record recently wrote an insightful piece (subscription required) about healthcare jobs in Iowa. Even though jobs in the healthcare sector have surpassed U.S. manufacturing and retail sectors for the first time in 2017, Iowa’s manufacturing sector – at least for now – still outpaces healthcare jobs in our state. Other than rising demographic trends of an older population requiring more healthcare services, the most plausible reason for more healthcare jobs is likely due to gross inefficiencies in an inordinately complex environment. As mentioned in my previous blog, “Healthcare Billing Process – The Cost of Doing Business,” non-healthcare industries might typically employ 100 full-time equivalents to collect payment for $1 billion in services, but healthcare employs 770 full-time equivalents per $1 billion of physician services. Keep in mind, healthcare is now a $3+ trillion-dollar industry – which primarily explains why healthcare jobs are soaring past other more-efficient sectors. 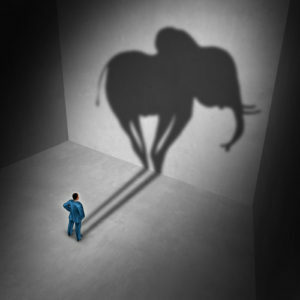 Regarding healthcare, if each of us fails to recognize, acknowledge and confront the elephant in the room, we too become complicit in this persistent, serious and increasingly costly and harmful problem. If we continue to sit on our hands and do nothing, we eventually enable the elephant to become even larger and more undisciplined. 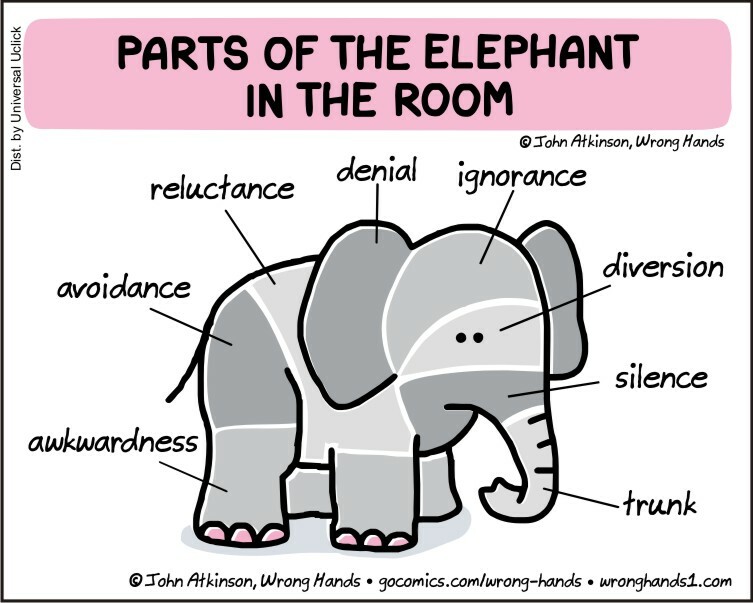 So what is this elephant in our collective “healthcare room?” John Atkinson of Wrong Hands developed a ‘chartoon‘ about this metaphor, whether the elephant appears in healthcare or elsewhere. Isn’t it time to begin “eating” this elephant one bite at a time? It starts by recognizing and acknowledging the elephant in the room, and then crossing that road to initiate necessary improvement. To learn more, we invite you to subscribe to our blog. For the services they provide, hospitals are predominantly recipients of our tax dollars, government-related grants, philanthropic donations, insurance premiums and personal out-of-pocket payments. Electronic Health Records – The Bane of Medical Progress? 20th Iowa Employer Benefits Survey Now Underway! Eliminating Unnecessary and Inappropriate Care – Could Health Premiums Drop to 2010 Levels?